Happy Wednesday! Time for Helpful Hump-day Hints – but the truth is I don’t know if I have any! My house is a mess. M-E-S-S. Laundry is piling up (even though the washer is always going), toys are taking over (even though it seems like I am constantly picking them up) and don’t even get my started on my kitchen or bathroom which both need a good scrub. Seriously? 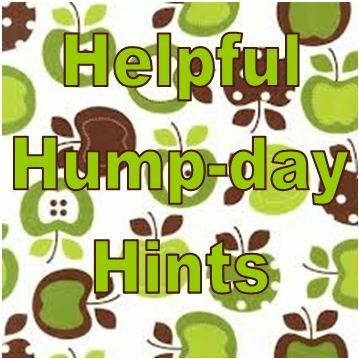 Who the heck am I to give you some helpful hump-day hints this week? So really this post is for me… I have been too overwhelmed at how much I need to do – that I have forgotten one of my favorite things to do! Make a list! Today I will complete one obtainable task (I will sort the mail that has started to pile up) and I will make an organized list for tasks that I will accomplish this weekend. HHH#1 – Sort mail that has piled up – trash or keep. HHH#2 – Make a list of tasks that can be accomplished this weekend. Hey – look on the bright side – the weekend is almost here! I need some organizational inspiration – what are you working on? I am organizing and lining my cabinets….two a day! Good One! Do you read the blog iheartorganizing? http://iheartorganizing.blogspot.com/ She has been talking about her pantry and cabinets this week. Hope you and the kids are well – thanks for reading and commenting!